America’s students are learning skills for tomorrow with dial-up speeds of the past. A smarter E-rate can connect 99% of our students to high-speed broadband in five years. Learn more about EducationSuperHighway’s vision for a smarter E-rate. Digital learning has a critical role to play in the pursuit of excellence in America’s schools. It is poised to revolutionize the way teachers teach and students learn, but that’s not possible unless high-speed broadband gets to schools first. Robust Broadband is Critical to Our Children’s Future. Who has Enough? The federal E-rate program has connected schools and libraries to the Internet since 1996. 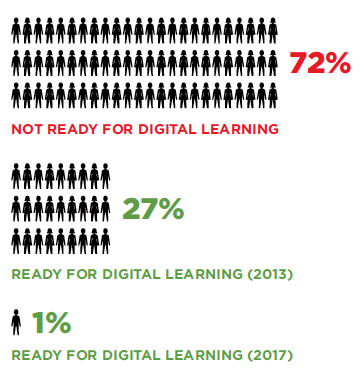 Unfortunately, that access is not close to what is needed for today’s digital learning tools. A modernized E-rate can pave the way to power networks that last a generation. Shift focus to broadband infrastructure. E-rate must move away from legacy technologies that are only capable of yesterday’s dial up speeds. Create a one-time capital investment fund. Intended to connect every school and library to fiber and every classroom to Wi-Fi, it will allow all schools to meet the connectivity goals proposed by the President, save billions, and put in place the infrastructure needed for a generation. E-rate can reduce costs and improve efficiency by collecting and releasing more data about network infrastructure, how funds are spent, and what providers charge. While the E-rate program was enormously successful in bringing basic telephone and broadband to schools and classrooms, the connectivity provided is no longer sufficient. The E-rate of yesterday…needs to be updated to support today’s Gigabit fiber and Wi-Fi connectivity. Modernizing E-rate is critical for our students and teachers. Investing in high-speed broadband infrastructure and wireless network upgrades for schools and libraries is an educational necessity and an economic imperative for our country. By modernizing the successful E-rate program, we can give students access to modern tools today so they can succeed tomorrow. As CEOs and innovators working to unlock the power of technology to personalize learning, empower teachers, connect parents, and ensure equal educational opportunity for all, we are writing to urge swift action to modernize the E-rate program and connect America’s students to high-speed broadband and ubiquitous Wi-Fi. We are writing to urge swift action to modernize the E-rate program and connect America’s students to high-speed broadband and ubiquitous Wi-Fi. In schools with robust broadband infrastructure, technology is already transforming how teachers teach and students learn. Gigabit speeds are enabling one-to-one learning technologies that let students learn at their own pace; two-way video that beams in experts and experiences from around the globe; blended learning models that let teachers spend more time in small group instruction; immersive learning games as engaging as the best video games; online assessments that provide real-time feedback to address issues before students fall behind; and collaboration tools that give parents daily access to their children’s homework and grades. In short, broadband is the foundation for the 21st century classroom. Broadband is the foundation for the 21st century classroom. Unfortunately, nearly 40 million of America’s K-12 students are being left behind without the Internet access and Wi-Fi they need to take advantage of the power of digital learning. If we want our students and teachers to have the opportunity to utilize the next-generation educational applications and content our companies are creating, America’s schools need 100 Mbps or more of Internet access today and 1 Gbps by 2017. High-speed broadband can help us out-educate, out-innovate, and out-compete the world. High-speed broadband can help us out-educate, out-innovate, and out-compete the world. It can help us better prepare our kids for the jobs of the future, foster a domestic educational technology industry that creates new jobs, and help the nation become more competitive on the world stage. Already, an estimated $4 billion a year is being invested in digital learning tools in America’s K-12 schools, a market that could grow to $10 billion by 2017 — helping to create a vital new industry focused on fueling our future while creating new jobs at home. Yet, instead of leading the world in digital learning, we are putting our students, teachers, and educational technology innovators at a significant disadvantage. Countries around the world already recognize that high-speed broadband isn’t just an educational necessity; it’s a competitive imperative. In South Korea, all schools are already connected to the Internet with high-speed connections, all teachers are trained in digital learning, and printed textbooks will be phased out by 2016. Australia, Finland, Ireland, New Zealand, and Singapore are close behind with programs to connect their children to world-class educational technologies. To win the future, we need not only to connect our kids with high-speed learning opportunities, we need to make sure that the technologies that will fuel this future are being designed, developed, and deployed right here in America. That is why it is imperative that the Commission act quickly to modernize, expand, and strengthen the successful E-rate program by: 1) focusing the E-rate program on broadband connectivity and infrastructure to ensure that we maximize the impact of E-rate on learning; 2) investing in upgrades, starting with the FCC’s $2 billion E-rate down payment to connect every school to fiber and every classroom to Wi-Fi; 3) improving the affordability of broadband for America’s schools by maximizing competition and the broadband options available; and 4) increasing transparency and accountability to reduce costs and improve efficiency by collecting and releasing more data about existing network infrastructure, how funds are spent and the prices paid by schools for their E-rate services. It is imperative that the Commission act quickly. Strategic innovation in the E-rate program will set the stage for America’s innovators to unlock the power of technology to ensure equal educational opportunity for all of America’s K-12 students. Expanding access to high-speed broadband is perhaps our generation’s single greatest opportunity to provide every student with access to the most effective and engaging educational content, applications, and tools ever developed. Nowhere is the opportunity so vast, the need so urgent, and the policy so vital for advancing a brighter more connected educational future. America’s schools need an upgrade. We must leverage technology to transform education and prepare our youth for the knowledge economy. Last summer, President Obama called on the Federal Communications Commission (FCC) to modernize the E-rate program to connect 99% of America’s students to high-speed broadband and ubiquitous Wi-Fi. Today, America’s CEOs call on you to ensure that the funding is available to upgrade K-12 school Internet infrastructure for digital learning. Today, America’s CEOs call on [the FCC] to ensure that the funding is available to upgrade K-12 school Internet infrastructure for digital learning. Scarcely a business exists today that has not been transformed by the Internet. It has changed how we create and deliver our products, find our customers, and service their needs. The Internet has also altered the very nature of work and the skills individuals need to be competitive in the knowledge economy. If a business does not embrace technology and the Internet, that business will be unable to compete in the global economy. Likewise, if our schools do not embrace technology and the Internet, our children will be unable to compete in the global economy. America’s businesses need a workforce that is prepared for the knowledge economy. We need schools that teach our students the 21st century skills that are the foundation of a competitive workforce and whose graduates are college and career ready. In an era of scarce resources and increasing complexity in the classroom, digital learning represents our country’s best hope to transform its K-12 education system to meet these goals. America cannot afford to stand by while our competitors around the world invest in the future of education and a workforce that is superior to our own. We need schools that teach our students the 21st century skills that are the foundation of a competitive workforce and whose graduates are college and career ready. The foundation of digital learning is robust Internet infrastructure. Unfortunately, 72% of our schools and more than 40 million students do not have access to the connectivity and equipment they need.1 To ensure that every student has an equal opportunity to participate in the knowledge economy, we must connect our schools to fiber and deploy ubiquitous wireless networks to all of our classrooms. The E-rate program has the resources to make this investment. The FCC must act boldly to modernize the E-rate program to provide the capital needed to upgrade our K-12 broadband connectivity and Wi-Fi infrastructure within the next five years. The FCC must also ensure that E-rate funding is spent effectively. In this era of scarce resources the FCC should focus E-rate spending on upgrading America’s K-12 Internet infrastructure and help schools dramatically lower the cost of bandwidth. This can be accomplished by using E-rate funds to provide the capital investment to connect our school districts to high-speed fiber networks. This is a financially sound investment that will lower bandwidth costs, enable investments in Wi-Fi upgrades, and generate tremendous returns for both our students and the American taxpayer. The FCC must act boldly to modernize the E-rate program to provide the capital needed to upgrade our K-12 broadband connectivity and Wi-Fi infrastructure within the next five years. We are grateful for the FCC’s attention to this critical issue and stand ready to help achieve this important mission for America’s future.